Have you ever been on a cattle drive and forged a raging river, played mid-wife to a mother cow, and used cunning teamwork to outwit villains? And I can promise that none of those things that happened above in the movie “City Slickers” (with Billy Crystal) will happen to you when you venture into the mountains on horseback! However, if you’re a city slicker, (similar to the movie) a trip with The Trail Riders of the Canadian Rockies will be an unforgettable adventure of a lifetime as you forge new friendships from sharing a remarkable horseback trip into the majestic Canadian Rockies. If they are not on your “bucket list” you’re missing out! Thanks to this 93-year-old non-profit organization (T.R.C.R.) – you too can trade in your minivan for a mare and hit the mountains. It operates three, six-day and one four-day, professionally guided trail rides each summer. The rides always take place in the backcountry with a different location chosen each year. You don’t even have to be able to ride to do it, though you have to like horses and be willing to learn. Riders come from all over North America and overseas to attend these historic, western, cowboy cultural trips. Book NOW and receive 20% off on ride #2 (either 6 or 4 day)! The T.R.C.R. are in the business because they want their fellow countrymen and international friends to be able to enjoy this great land, to ride into the remote areas of the mountains with a good degree of comfort and at a reasonable cost. They have been doing this for 92 years out of the Calgary, and now have a large “Boomer contingent” every year. Many people come back year after year to renew acquaintances and make new friends. In fact, the Trail Riders have a high guest return rate with some riders having been on 30 or more rides! Over 60% of the riders are +50, and 70% are adventuresome women! The cost includes everything from a membership in the organization and Parks Canada backcountry user fees, through to horses, accommodations, meals and entertainment. Guests bring along their own sleeping gear, extra clothes and other personal necessities. Individuals and families are welcome on the trips but a parent or guardian must accompany anyone under 18. 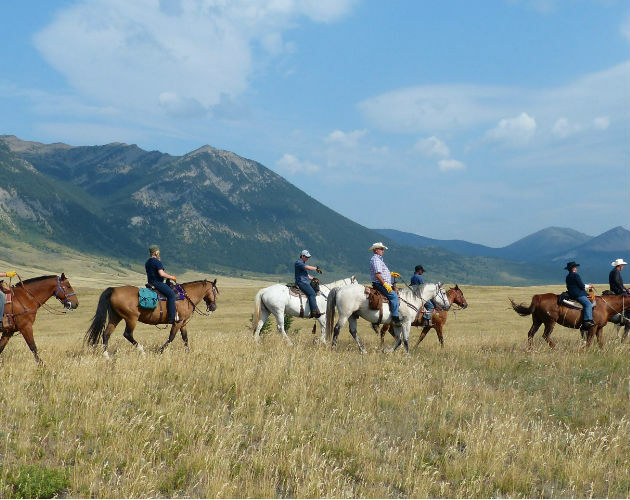 If there is a requirement for membership, it is that a person enjoy horseback riding, the great outdoors company of a few like souls, and a desire to submerse themselves in the cowboy culture and way of life – the Western Canadian way! Riding experience of the member’s ranges from very little to years in the saddle (ie. beginners are welcome). The riders travel by bus to the trailhead corral where they are met by cowboys and horses. Here the dudes are matched with a horse according to the information given on their application form. Each horse is a sure-footed, well broken animal, accustomed to the sometimes rocky terrain and tolerant of the greenest tenderfoot, and horses travel at a steady pace. 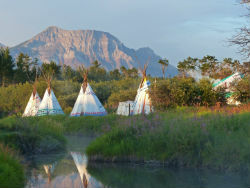 At the base camp (known as “Teepee Town”) the riders are assigned to Native style Indian teepees and tents, which will be their home for the next five days. There is a washstand with plenty of hot water available for use by guests, and a propane hot shower! For the next four days, the riders follow a basic daily plan. A full hot breakfast, from 7:30 – 8:30 am and by 9:30 am the cowboys have the horses saddled, and the riders are off on a new adventure. Each day will find the riders exploring lakes, valleys, glaciers or mountain passes, some accessible only by horse. The high, uninhabited valleys of the Rockies offer peace and contentment combined with the thrill of majestic visas. There is a sweep and majesty to this land, a towering grandeur and nobility of face, so powerful in its vast silence. This alpine land abounds in larch, spruce and fir trees, mountain animals and birds, meadows and parklands leading to the nearby snow capped peaks and ridges. The whole day is a photographers dream come true with ample opportunity for viewing wildlife. By noon, the riders have reached their destination and a picnic lunch, is served near a lake or a stream. Afterwards, riders can fish, stroll, visit or stretch out for a nap in the hot mountain sun. By late afternoon, the dudes are back in camp for “happy hour” before enjoying a four-course dinner; chicken, steak, ham, roast turkey and prime rib Alberta beef are alternated. By 7:30 pm the cowboys light a roaring fire in the “Doughnut tent” and an evening of singsong, square dancing, cowboy poetry, story-telling and live entertainment complete the day. On the morning of the sixth day, the riders are up early packing their duffle and riding out one more time before boarding the bus back to Calgary. 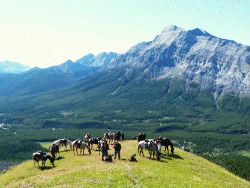 Each year the Trail Riders travel into a different area of Canada’s famed Rocky Mountains. This summer, the Trail Riders will explore Waterton Lakes National Park, a world UNESCO site. From base camp, the daily rides will include trips to Goat Lake, Spinkop Ridge, Blue Lake, Lone Lake, “the Lions Head” and finally Sofa Falls. Objectives of the Trail Riders are to “encourage travel on horseback through the Canadian Rockies, to foster the maintenance and improvement of old trails and the building of new ones; to encourage the love of outdoor life, the study and conservation of birds, wildlife and alpine growth, to assist in every possible way to ensure the complete preservation of the National Parks of Canada for the use and enjoyment of the public.” The T.R.C.R. continues to operate with a volunteer board of directors as a non-profit organization, and this year will celebrate its 93rd year of riding. For further details about the Trail Riders of the Canadian Rockies, check out their website and be sure to watch the 3 minute YouTube video on the homepage. Contact them for help planning your trip to Waterton Lakes, Alberta in the beautiful Canadian Rockies, and/or the world famous Calgary Stampede. Check out the reviews on TripAdvisor!